A scholarship, bestowed by a college or university, always brings happiness for students. You must be a hardworking student and thus you have earned the scholarship. However, your success shall not endorse arrogance. Right after getting a scholarship, your primary duty or basic etiquette is writing back a Thank You Letter to the college or school management. 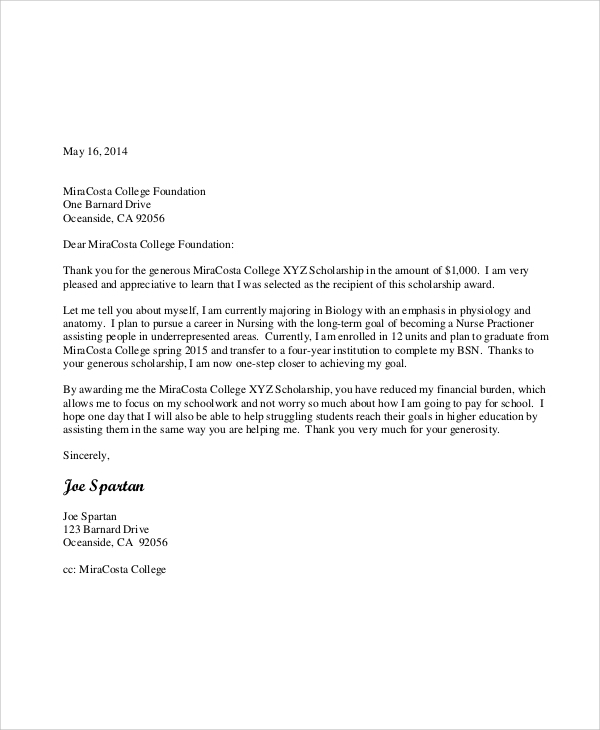 A scholarship thank you letter can be described as a letter of appreciation. It will appreciate college or university management for granting your scholarship. When you are offered a scholarship from college, you should write a thank you in return to show a good gesture. 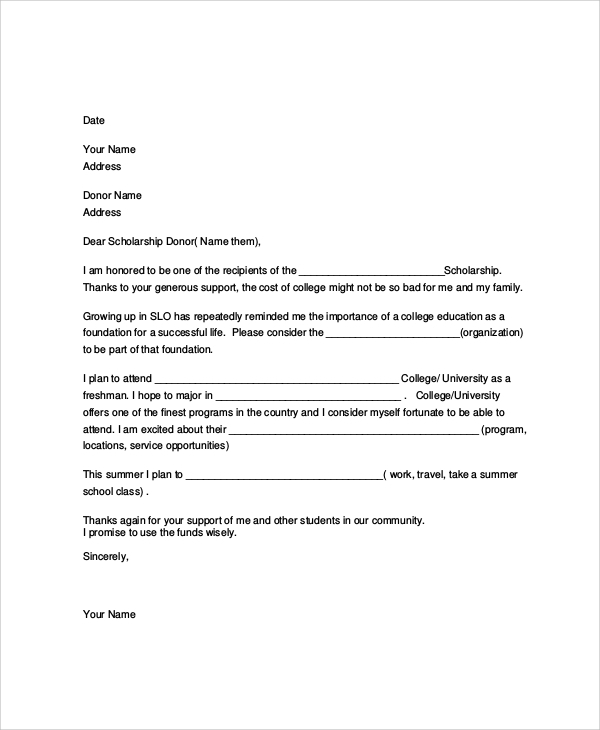 For that, you can use this college scholarship thank you letter, available in downloadable PDF file format. Nursing students are entitled to get various types of scholarship programs from the colleges or institutions for nursing training. When you receive a scholarship, it is a good gesture to write a thank you letter as scholarship acknowledgement. 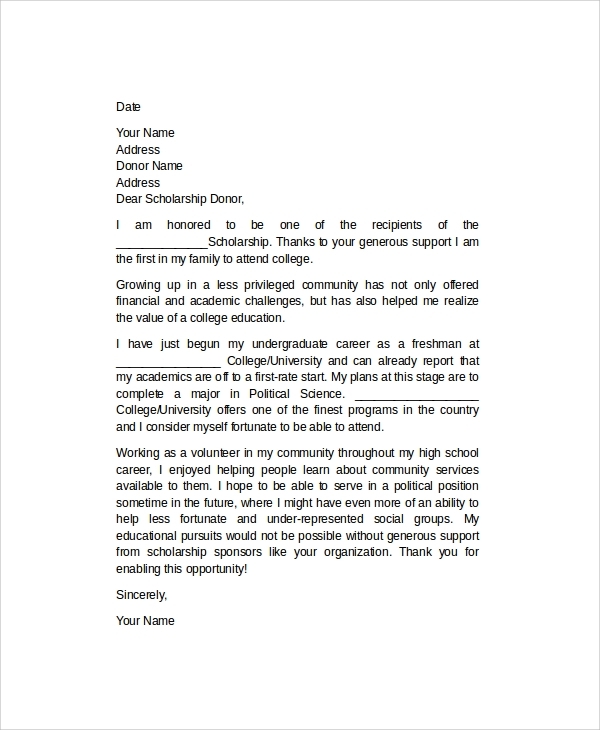 This scholarship thank you letter sample is available for the students who want to thank school authority for granting him or her scholarship program. The sample is professionally written and perfectly formatted. Primarily, you need to write a thank you letter as an etiquette or good gesture. For example, if someone gifts you something, in return you can send a good thank you letter to that person. However, not all kinds of thank you letters are written for the same purposes. Some of the letters are written as an acknowledgment too. For example, we can consider the case of scholarship thank you letter. It is not just a mere thank you letter or etiquette, it is an acknowledgement too. Through this letter you let college or university management know your regards and acknowledgement for the scholarship program that you have been offered. Who Needs to Write Scholarship Thank You Letter? 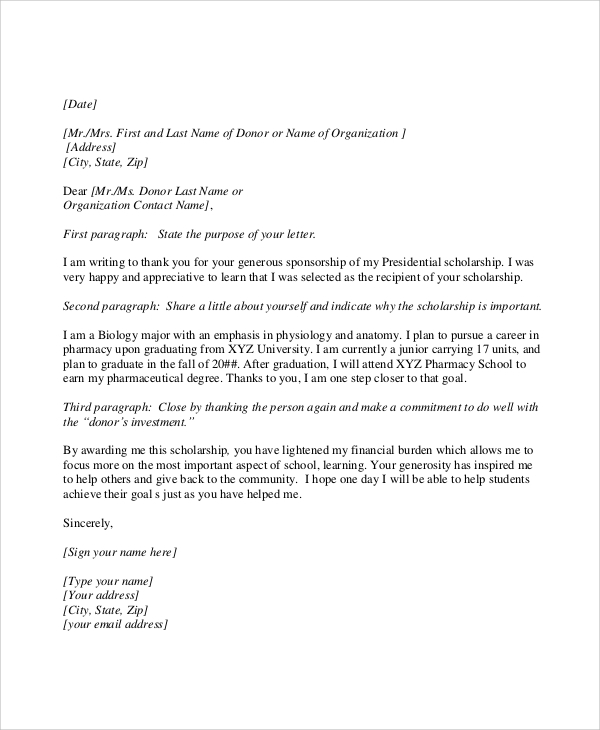 Scholarship thank you letters are generally written by students and research fellows, who have been awarded scholarship by the institution or college or university. Students are provided scholarships as per their merits. Some students are talented, but they do not have the sound of economic background to conduct their higher studies. In such cases, colleges offer special financial aid or dole to such students. Generally, good performing students or dedicated students are entitled to get a scholarship for conducting their studies. Irrespective of reasons behind your scholarship achievement, you always need to keep good etiquette in mind. The right thing is writing a thank you letter when you have been awarded scholarship.You can also see Customer Thank You Letters. Writing a scholarship thank you letter is a difficult job, especially for those students who have never written such letters. The letter should be precise, but it must be well written too. Perfectly written thank you letter will create a good impression for you among the faculty members and college authorities. 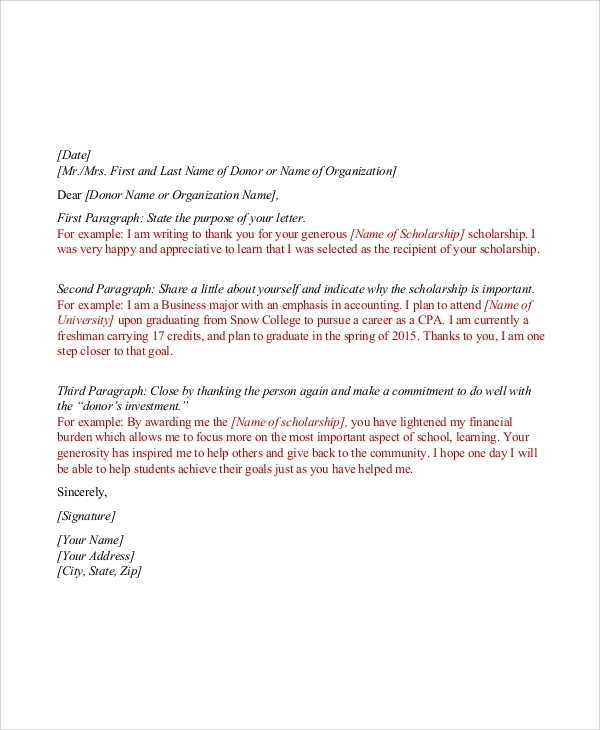 Like other formal or informal letters, scholarship thank you letter should come with the proper format. The format can be changed, but the basic structure should not be altered. Keep a simple subject line for writing scholarship thank you letter. To write better quality scholarship thank you letters, you can use the online templates or samples. After being awarded special scholarship programs, many students tend to miss out one simple gesture and that writing back a scholarship thank you letter to college or institute management. To write such formal thank you letter, you can always check for the example of thank you letter online. You can also see Business Thank You Letters.